Our trip to the Guyanese interior started at dawn in Georgetown. 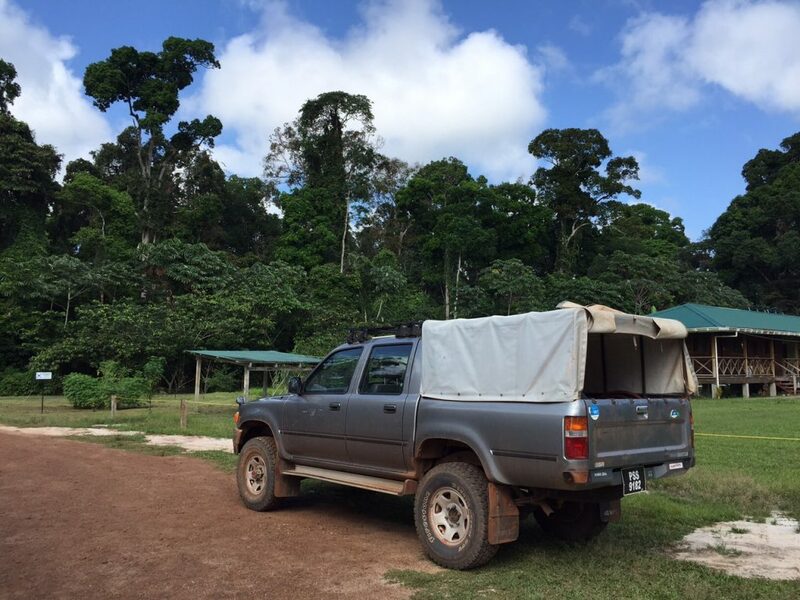 We elected to get a private pick up by 4WD as we had had a bad experience with buses on our trip to the Amazon in Brazil. So at 6am our driver picked us up and we started on our adventure into the jungle. 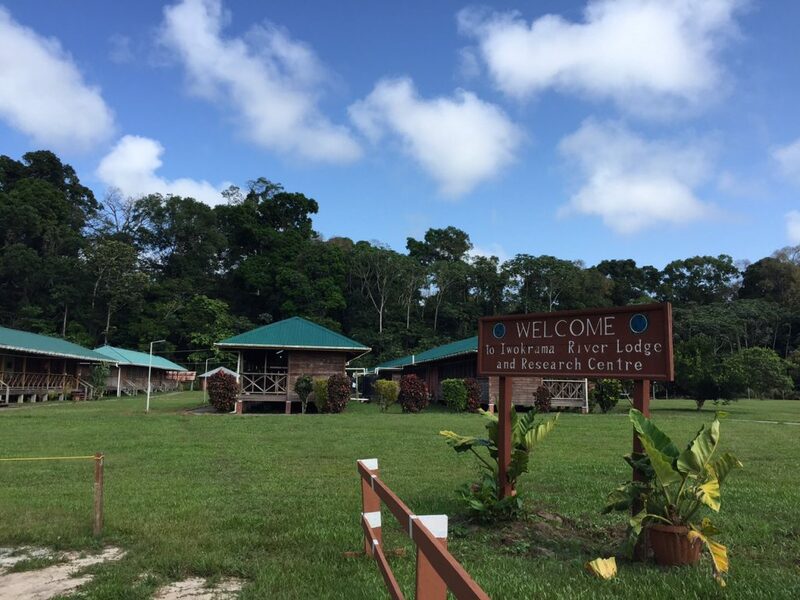 Our destination was the Iwokrama River Lodge but the journey was also an adventure. The drive took a total of 10 hours, mainly due to the poor road conditions after the wet season. 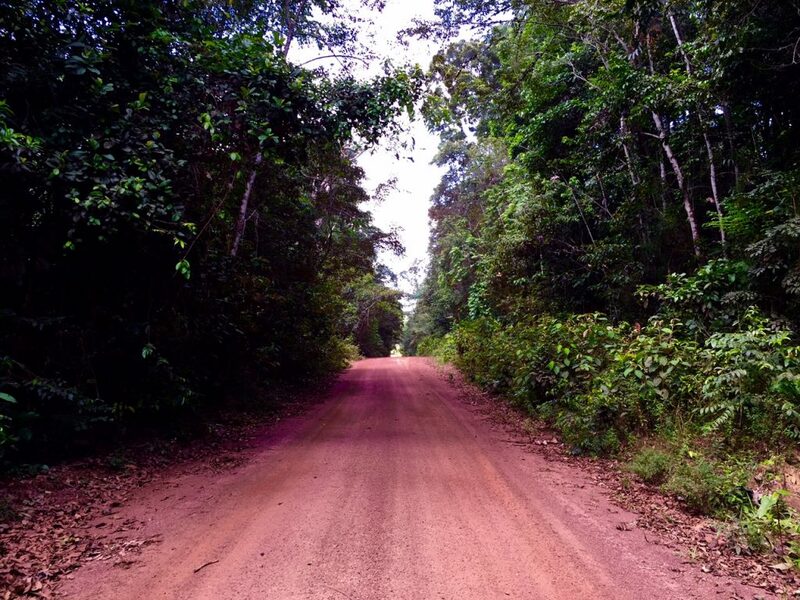 The road turned to dirt and as we went further into the interior and it became narrower and narrower with the jungle encroaching on both sides. It then slowly changed from a dirt road to a single lane track with many potholes filled with rain and mud. This made for a slow and bumpy ride and the last 100km of our journey took over 4 hours. 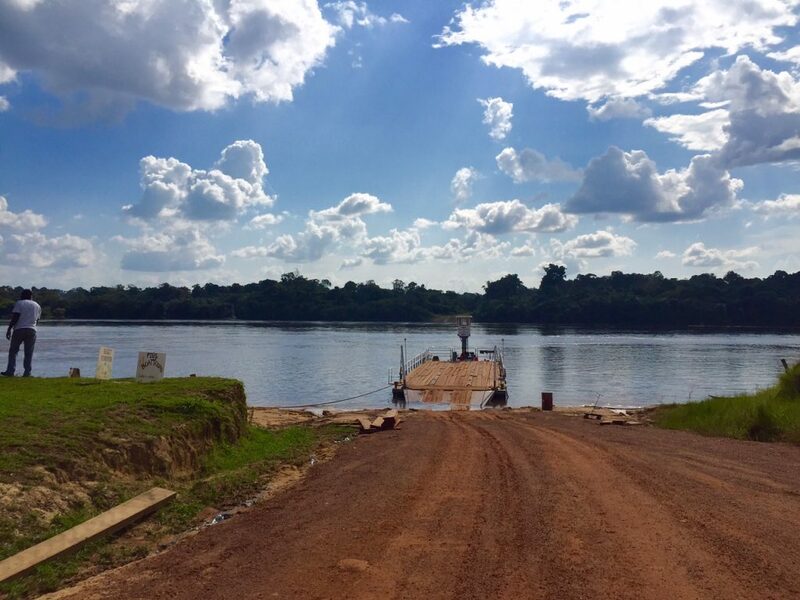 The last part of our journey involved a ferry ride (on what was essentially a pontoon with an engine) across the Essequibo River, the third longest river in South America. The lodge was just on the other side of the river but we still had to wait for an hour for the ferry to take us across. Upon arrival at Iwokrama Dan and I cheered. I can’t explain how happy I felt about being able to get out of that car! But there was no time for resting after as we had activities planned straight away. 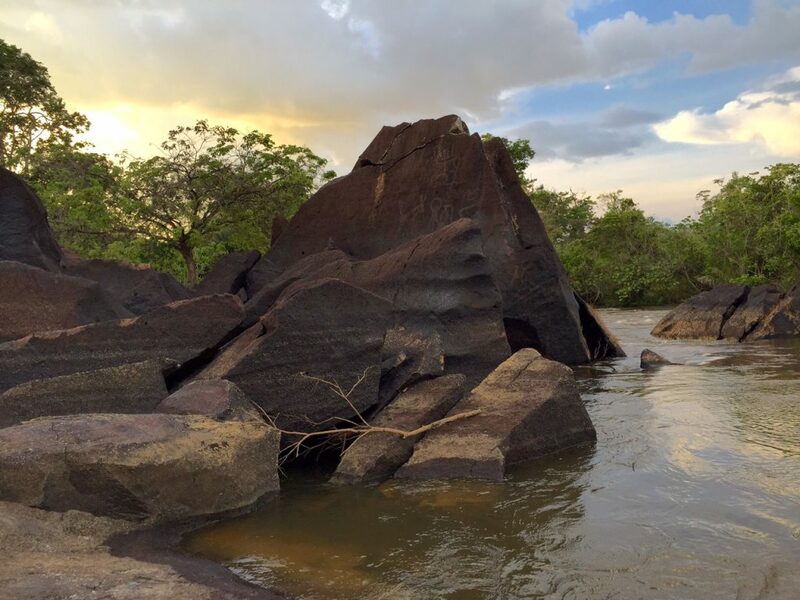 The drive had taken longer than planned so we were told to drop off our bags and head straight down to the dock for our first adventure, a boat ride through the rapids of the Essequibo river and a visit to some petroglyphs from the ancestors of the local Amerindian community. The boat ride was a little scary but our boat operator was skilled and easily navigated the waves as I tightly gripped the side rail. It was worth it when we got to the petroglyphs which were over 6000 years old and surprisingly still very distinct. We headed back for dinner where we met the four other people staying at the lodge. They were all older than us and on a bucket list trip around Guyana. Two of the gentlemen were old friends but they bickered like an old married couple. They had come together as their wives wouldn’t come to South America with them. As we ate dinner we were all delighted to be joined by a group of little bats that were feasting on the insects that were attracted by the lights. They silently zipped around us as they ate the moths and mosquitos, saving us from being bitten. They were much more effective than mosquito repellent! After dinner we went down to the dock for a boat ride to search for caiman. The caiman in South America are closely related to the North American alligators and can grow up to 5 metres long, so I was a bit anxious about heading out at night with just a small boat and a flashlight! We went into the dark with the flashlight scanning the surface of the water looking for the reflection of red eyes. And we weren’t disappointed. The first caiman’s eyes lit up like lights as the boat manoeuvred closer. This caiman was only a baby, about a metre or so in length. It sat there with its head just above the water but as we came closer it ducked under the surface. So we set off again into the dark looking for another one. As we cruised along in the night air the scene took my breath away. You could just make out the silhouette of the trees lining the river and there were fireflies darting in and out between the branches. Occasionally a firefly would come out across the river and buzz over our heads like a little fairy light. It was enchanting. Then, when you were least expecting it, a tiny fish would leap from the water trying to catch the insects, and your heart would skip a beat thinking it was something larger. Just when I was starting to think I would be happy if we didn’t see another caiman our tour guide pointed across to the other side of the river where there were two bright little red eyes reflecting back at us. 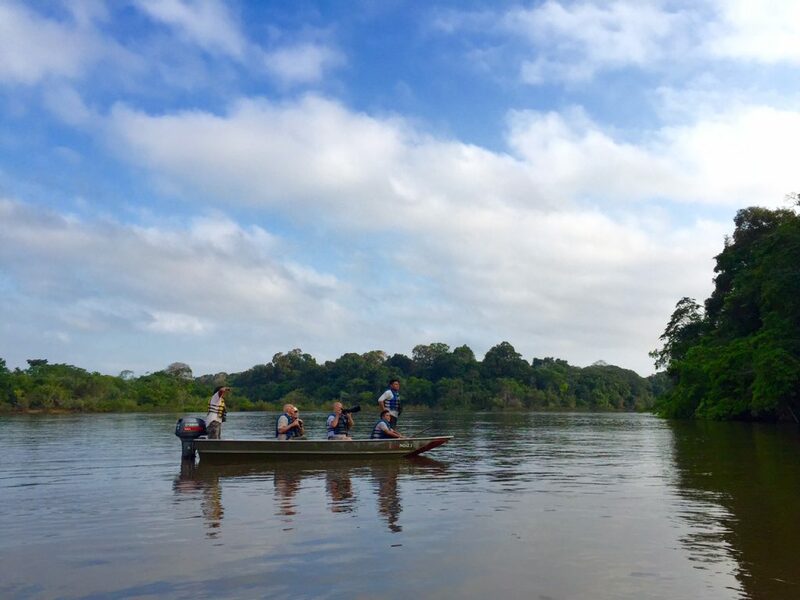 This time as the boat pulled closer the caiman stood its ground, and we could soon see why. The caiman stood its ground, and we could soon see why! This caiman was much bigger, at least 3 metres, and he wasn’t too scared of us. Our guide seemed calm though so we got out our cameras and started to take photos. I was surprised when the caiman stayed still as it had its photo taken with a bright flash going off in its face. We started to drop our guard and the boat edged closer so we could get a better shot. We would have been only a metre away when the caiman suddenly leaped out from the water angling for the back of the boat! We all screamed and jumped out of our seats, our guide included! Lucky for us it didn’t get in the boat and instead dove under the water. But then we started to hear something hitting the bottom of the boat. Nervously we looked down, thinking the caiman must be under the boat! But it was only a fish that had leapt from the water and was now flip flopping around on the boat floor. It must have been spooked by the caiman and jumped in! Once we had all started breathing again we put the fish back over the edge and decided to go back to the dock. No one wanted to find any more caiman tonight! No one wanted to find any more caiman tonight! 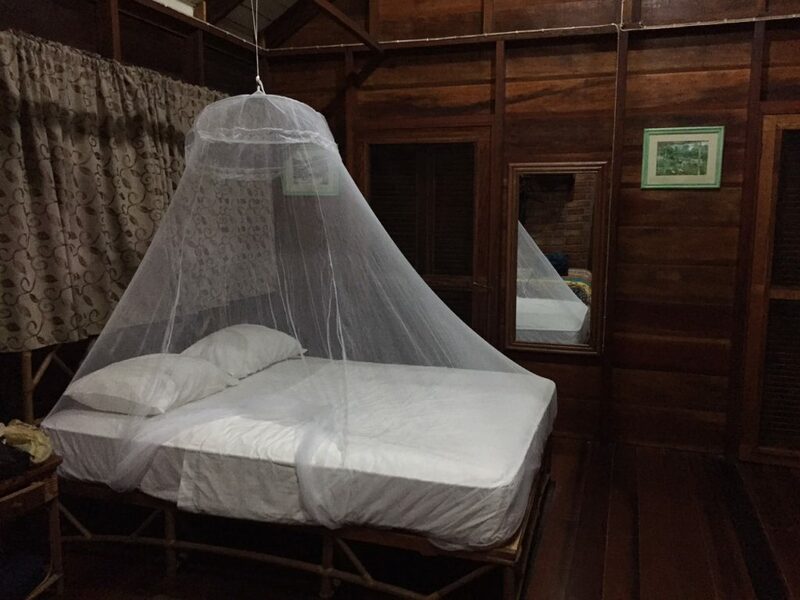 Our room had been made while we were out, and with the mosquito net over the bed I thought it looked like something from a story book. I fell asleep easily after such a big day and woke early the next day. While still half asleep with my eyes almost closed I saw something flashing in the room. It was still dark at 5:30am but as I opened my eyes I watched the flashing light move around the room. It was a firefly! It must have come into the room during the night. Dan and I smiled at each other and drowsily lay in bed watching it fly around the room for quite a long time, mesmerised by its light. It was something from a fairy-tale and remains one of my favourite memories from our trip. Once the sun started to rise we realised we were running late for our dawn excursion to look for animals along the river, so we jumped out of bed, got dressed and rushed down to the dock just in time to leave. The trip did not prove to be too eventful as it seemed all the animals were having a sleep in (like I wished we had). 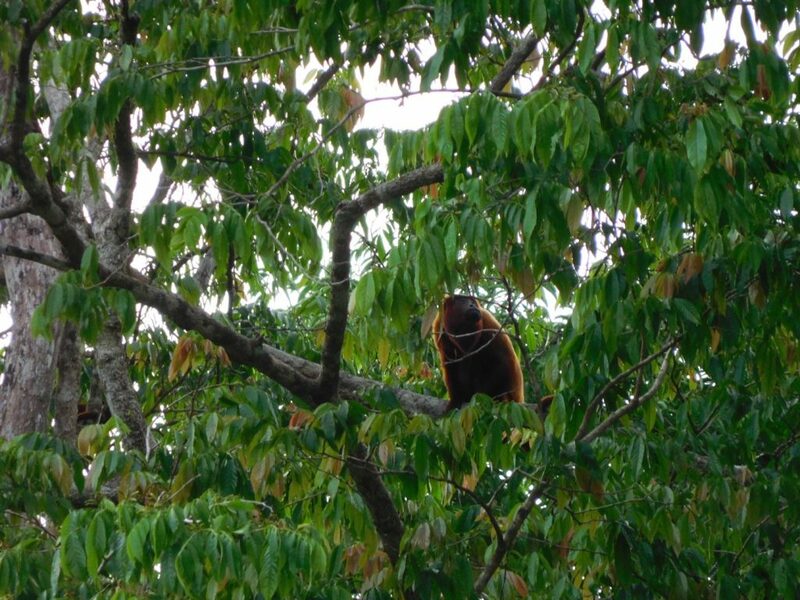 Just as we were about to give up and head back our guide spotted some red howler monkeys in the distant tree canopy. We managed to get a few quick shots before they started to move out of sight. The boat with the older group pulled up alongside ours and asked what we were looking at. I couldn’t help but silently laugh at the big cameras with huge lenses that would now get worse shots because the monkeys had moved out of sight. Sometimes it’s not the equipment but the timing that counts! Our next adventure was a hike up Turtle Mountain, which at 300m looked more like a hill than a mountain. 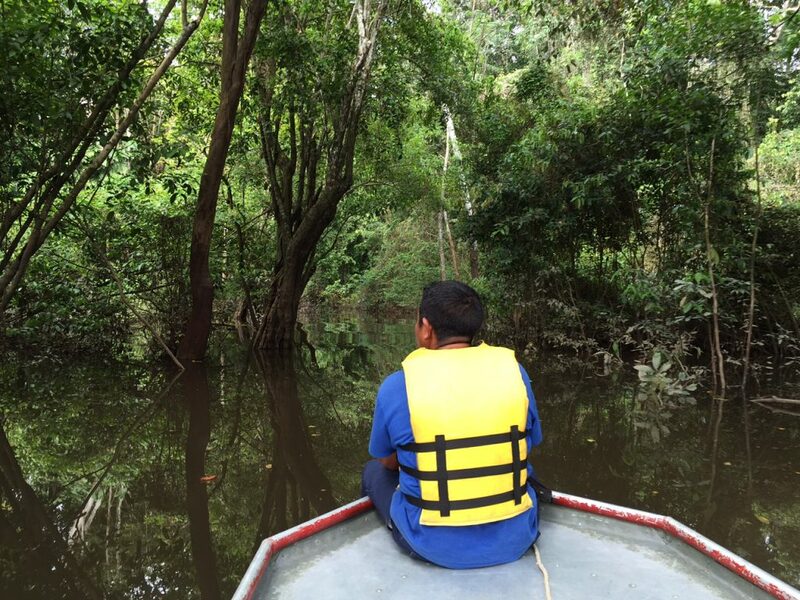 We took a boat ride to the base of the trail and started to make our way into the jungle. The environment left me wonderstruck. There were vines hanging from the trees, cicadas clicking loudly and butterflies the size of birds floating between the trees in splashes of blue and orange. We ventured further along the trail and as the grade started to increase I started to see why they had called it a mountain. The humidity under the shady tree canopy was close to 100% and even the slight uphill walk caused sweat to pour from every part of me. You could wring the sweat from my clothes and even my hair. I was drenched! As we the approached half way point we came across a large tree that had fallen across the trail. We managed to hop off from a nearby rock and scramble over it so we could continue our walk, and on arrival at the top, I was glad to see that the view was worth it. 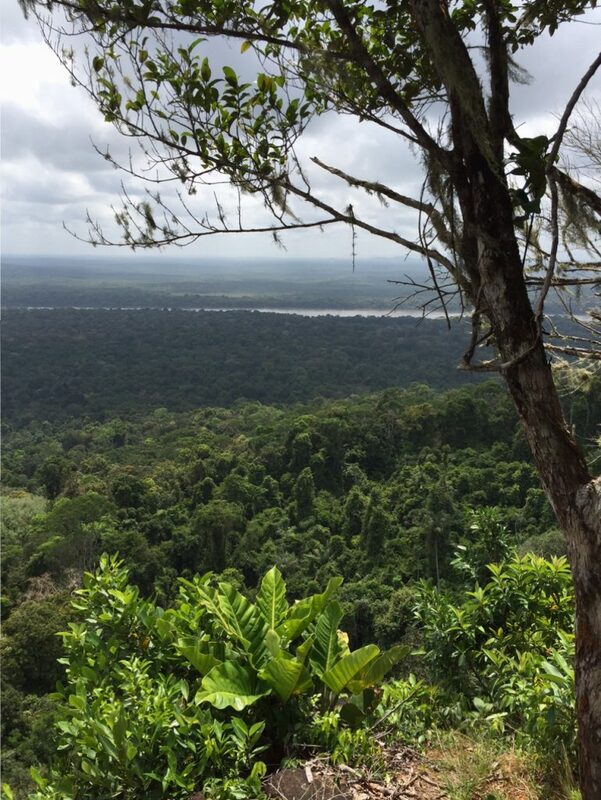 You could see across the canopy of the rainforest as well as the river snaking its way between the trees. Our guide came across to us with a surprise as we were sitting catching our breath. He had found an interesting spider! 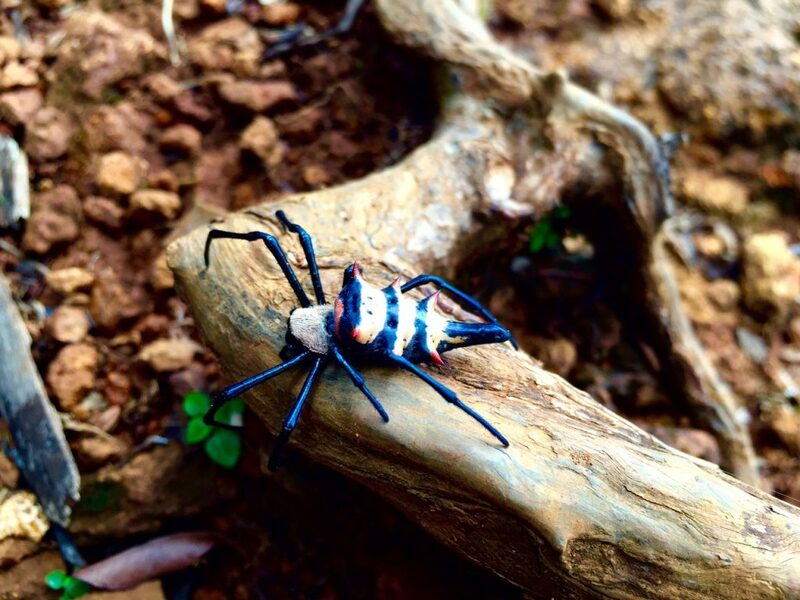 I have always had an interest in insects and arachnids so I was excited to get a few photos of the spider which had bright red spines on its back. It certainly looked poisonous and fitted in very well in the jungle environment! In a humorous twist the two older gentlemen friends were again ill fitted for photos as they had such big lenses they had to stand back to get a photo. Thankfully there was a steel cable on the edge of the lookout so they didn’t fall off! 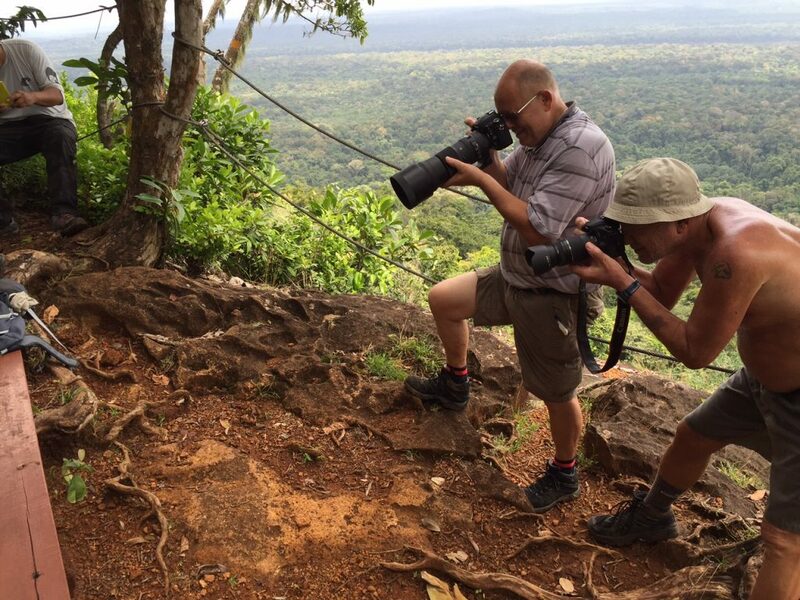 The jungle spider our guide found certainly looked dangerous! I have no idea what species it is though. Our walking companions once again proving it isn’t always the biggest lens that counts! The walk down was much easier until we reached the tree that we had climbed over. There was no rock on this side and the tree was too high to get up on without it. 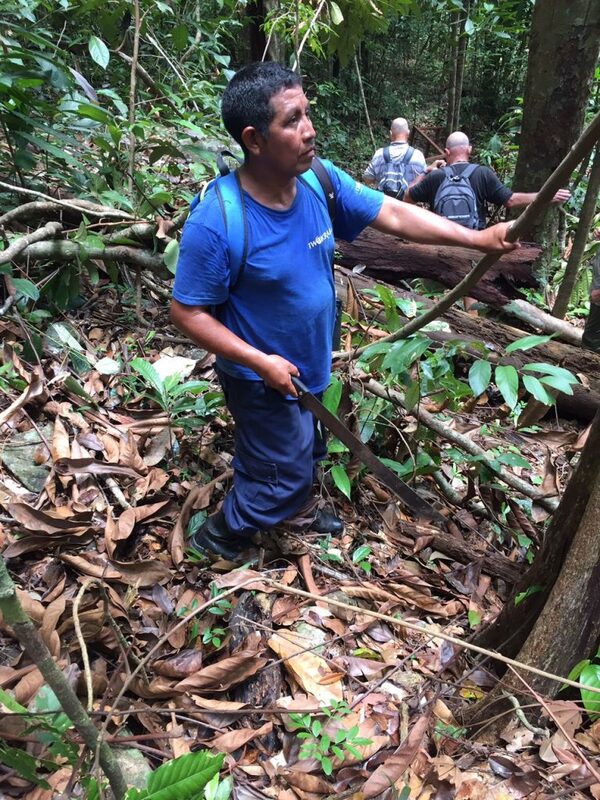 Lucky for us our tour guide was prepared and had a machete with him. 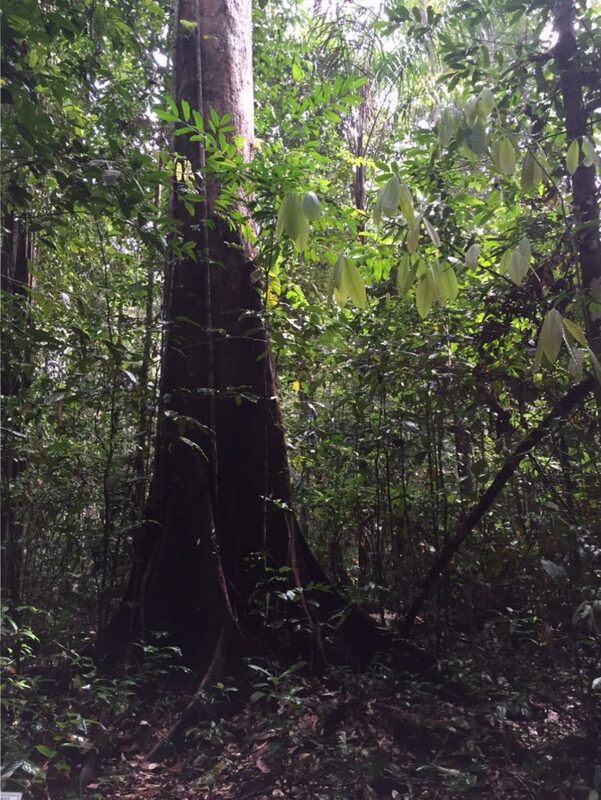 He hacked away at the jungle vines and made a clearing around the tree and back to the trail. I hastily tip-toed through the thick layer of fallen leaves that was crawling with insects and spiders. It made me appreciate the effort it must take to make these trails in the first place! The rest of the trail seemed like a breeze in comparison and we were glad to be back in the boat with the wind drying our sweat soaked clothes. After a hearty lunch we headed out again, this time we took a 4WD to the nearby Atta Lodge, and we were lucky enough to see a small caiman that was sunning itself on the dusty road on the way. 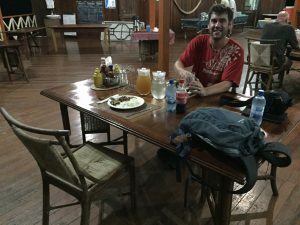 We reached the lodge and after a quick drink of fresh made tropical juice we began the walk up to the Iwokrama Canopy Walk. 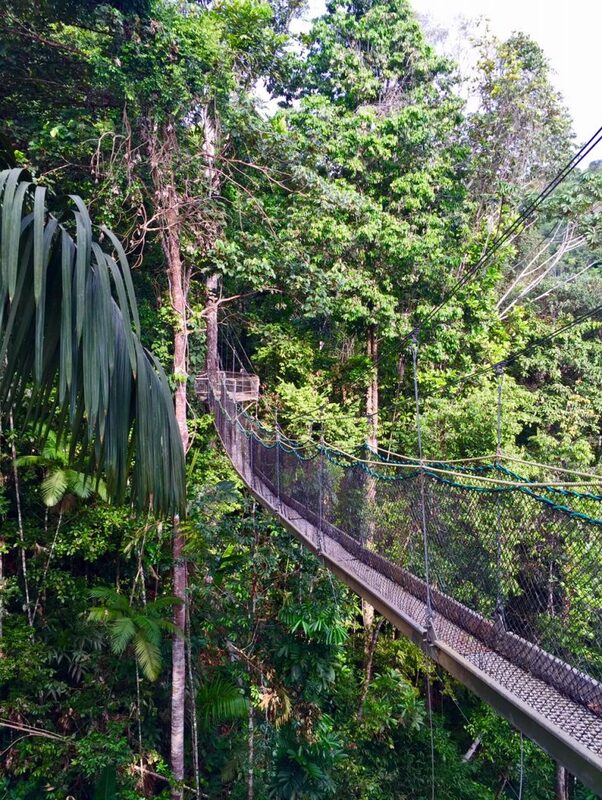 The Canopy Walk is a series of suspension bridges hanging from trees allowing people to walk in the tree canopy with the birds and monkeys. This sounded amazing but when we got up there the bridges looked shaky and rusted. After working with corrosion in my previous profession I must admit I was a bit hesitant to go out! But the guide assured me that the bridges were installed by a Canadian company and were regularly maintained. He even said he would go first. So after watching him walk to the first platform I decided to brave it and headed out. The first bridge. That is our guide already on the other side waiting for us to come across. My heart felt like it was beating out of my chest as the bridge wobbled with every step I took. I tried to turn the logical part of my brain off and appreciate the scenery, but it was proving difficult. Once on the opposite platform I breathed a sigh of relief. I had made it! Maybe it wasn’t so bad after all. But this feeling was short lived as while I was looking out from the platform my eyes came across a mangled metal frame of a bridge on the ground. As panic started to race through my mind I started to tell myself that I was already out there and it was too late to turn back, so I just had to finish it, and I needed to remember to ‘appreciate it’ on the way! I didn’t even want to think about the fallen bridge so I didn’t ask the guide what had happened, but he must have seen me looking at it and told me the story anyway. Apparently there had been a day of very heavy rain and a tree next to it had fallen and crashed into the bridge, taking the whole section out as it fell. This just added one more thing I needed to not think about as it had been raining heavily while we were at lunch. Great! See that tree on the floor. See the tangled metal planks beneath it. That is one of the canopy bridges after the tree tore it down as it fell. I was terrified walking across this bridge after seeing the one on the floor! The rest of the canopy walk went in a bit of a blur but the last bridge was the scariest. It had looked like it was in the best condition at the start but as I walked across, the aluminium planks under my feet started to lean to one side. I held my breath and walked as fast and softly as I could to the other side. When Dan and I both had our feet back on solid ground we celebrated still being alive, which has been happening far too often this year! We didn’t even see any monkeys or birds out there! The most interesting wildlife was some ants crawling on one of the platforms. 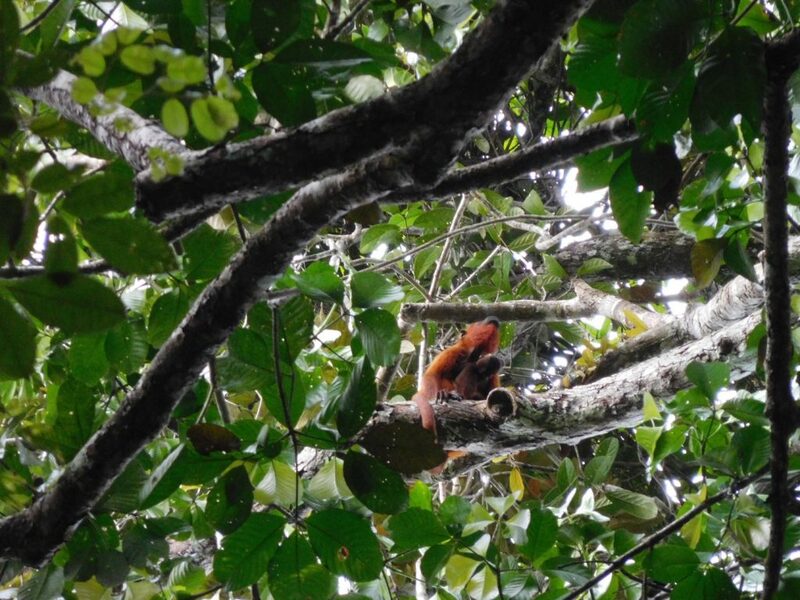 So it came as a surprise that on the walk back to Atta Lodge we came across a group of red howler monkeys making their way through the trees. 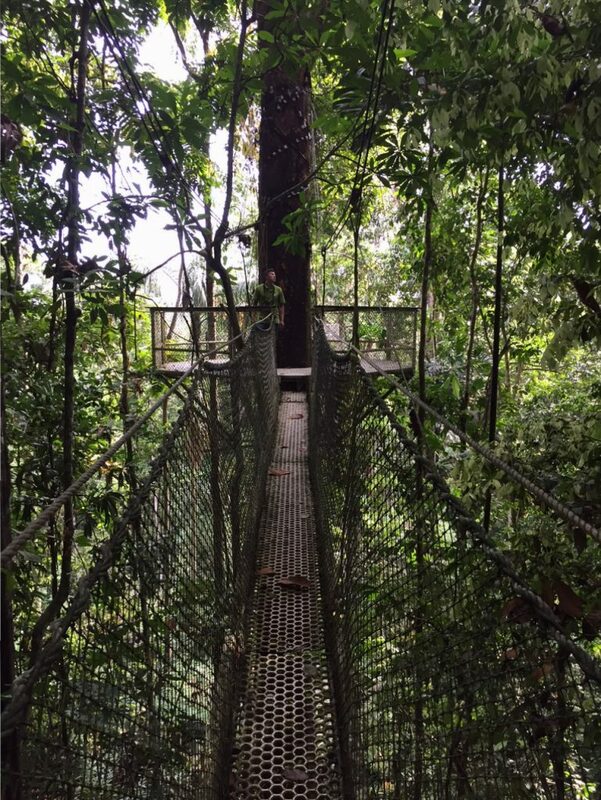 I found it funny that we had ended up seeing more monkeys from the forest floor than on the bridges! How ironic. 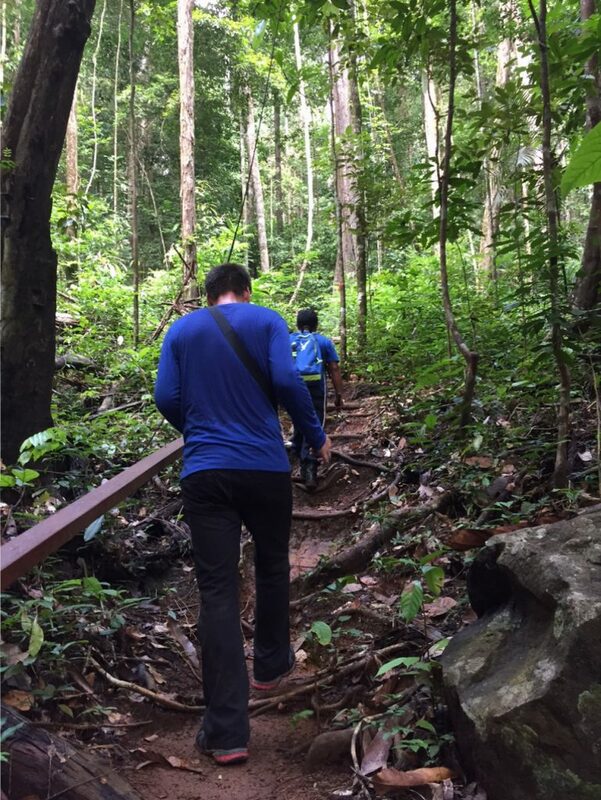 Our last day started with a morning nature walk through the jungle adjacent to the lodge. Once again a tree had fallen on the trail and our guide hacked a new clearing around it. If he ever finds himself out of work he would make a great samari! It must have been a few days since anyone had walked the trail as there were numerous spider webs across the trail. Even though the guide was walking at the front he was shorter than me so I kept catching spider webs on my face. Eventually I picked up a stick and just held it in front of my face to catch them. It worked a treat! Mother nature is a supreme artist. The jungle is beautiful. At the end of our walk I was time to bid farewell to the Iwokrama River Lodge and all of its wonderful creatures. All that was left was the 10 hour drive full of with pot holes, fallen trees and sunning caiman on the road. We had such a fantastic time it was hard to leave, but the promise of air conditioning and a shower in Georgetown helped us say our goodbyes. Goodbye Iwokrama! Until next time! 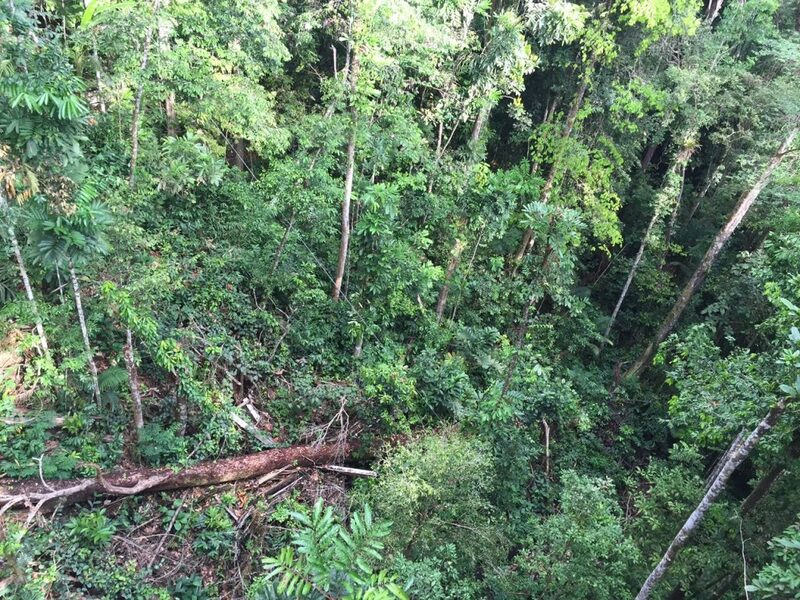 I really enjoyed reading about your jungle adventure with some great pictures. Not sure it would be something I would do, but knowing you I can see why it would be right up your street ! I am glad you enjoyed it Helen. I will try to include less spiders in the next one. I just find them so fascinating!